1 3-4 lb. cooked chicken, cut into bite size pieces (rotisserie chicken) OR use your turkey leftovers here! Combine soups, broth, and Rotel. Spray a 3-qt. casserole dish with refined coconut oil spray or avocado oil (or grease with grass-fed butter). Layer 1/2 of the tortillas, 1/2 of the meat, 1/2 of the cheese, and 1/2 of the soup mixture. Pour remaining cheese on top. Bake at 350 degrees for 45-60 minutes. Make sure you use the turkey carcass to make bone broth- it’ll help you get the most bang for your buck and is a nutrient dense option to add to soups and stews in place of chicken broth. 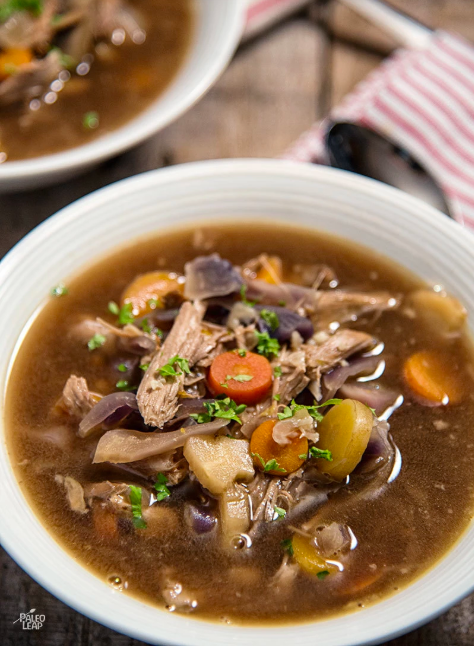 This turkey soup recipe is an amazing way to get the benefits of bone broth and stretch your leftover turkey for several extra meals. These sandwiches look super delish, with sweet potato pancake buns, cranberry relish, leftover turkey, and roasted brussels. This recipe is definitely on the indulgent side but sometimes good comfort food is worth it! Use GF noodles- I like Banza chickpea pasta (you can purchase it HERE on Amazon) and organic dairy products to upgrade this one. I love this take on reinventing Thanksgiving turkey. This curried chicken salad has a completely different flavor profile from the traditional Thanksgiving feast- this makes the turkey delish and exciting again! I hope these turkey leftover ideas have inspired you! I’d love to hear from you- share what you’re doing with your leftovers in a comment below!